We love a good sensory bin in our house and as Buddy gets older his engagement with them has definitely improved. Sensory bins can be used to teach textures, seasons, colours, numbers…. the possibilities are endless. You can read a great post about the purpose of Sensory bins over at Suzy Homeschooler. What is the Point of a Sensory Bin? At the moment, we love to use them to introduce Buddy to new materials and as always we make them taste safe for our happy little chomper! 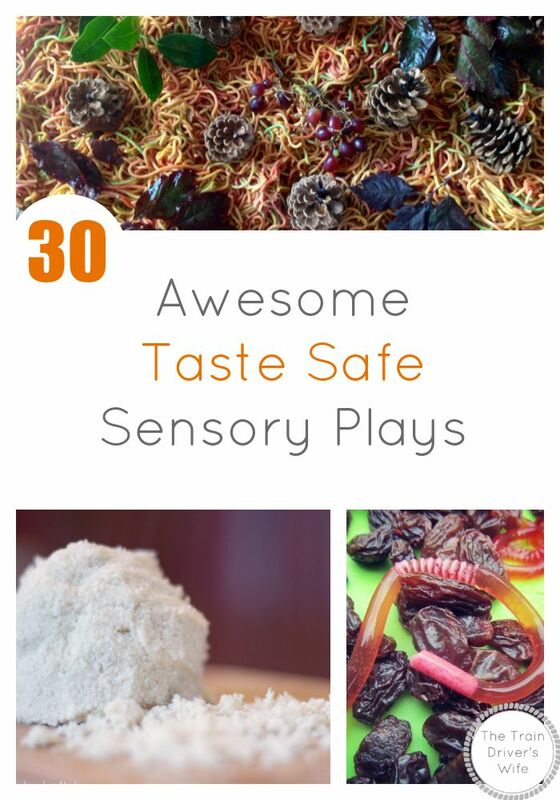 I am always on the lookout for great edible Sensory Bins so I decided to share 30 of our favourites with you. Get messy with some Rainbow Spaghetti. Make a creative Jello Rainbow as Craftulate did. Make a beautiful Edible Water Bead Rainbow. Make your own Edible Rainbowas Life with Moore Babies did. Have fun fishing for balls with this Water Ball Scoop. Enjoy some Under the Sea Edible Water Beads. Bring the outdoors in with this simple Snow Sensory Bin from Happy Hooligans. Enjoy a messy playtime with this Erupting Chocolate Oobleck from Learn Play Imagine. Play with Cloths and Sponges in this simple water activity. Explore this fantastic Apple Sauce Oobleck from Little Bins for Little Hands. Get messy and have fun with this Flour Play activity. Let your imagination run wild with this Vroom Beep Zoom sensory bin from My Small Potatos. Create your own building site with this Edible Sand. Enjoy this simple and fun Cereal Sensory Play from Nothing if Not Intentional. Make some noise with this clattering Pasta Sensory Bin. Enjoy the changing texture of this Instant Mashed Potato Sensory Bin from Montessori on a Budget. Even the smallest explorers can get involved with this Planets and Stars Discovery Bin from Artsy Momma. Make the most of your recycling with this Recycled Paper Sensory Bin from Little Bins for Little Hands. Introduce your baby or toddler to this taste safe Cloud Dough Discovery Bin from Lemon Lime Adventures. Discover Autumn with this Autumn Sensory Discovery Bin. Create your own Edible Wriggly Worms like Adventures of Adam did. Learn about apples and their colours with this Apple Sensory Bin from Frogs and Snails and Puppy Dog Tails. Introduce new foods with this Frozen Vegetable Sensory Bin from Hands on as We Grow. Create your own Edible Dirt Sensory Bin from Love Play Learn. Build a Taste Safe Garden Sensory Bin as Blog me Mom did. Get into the spooky spirit with these Edible Jelly Eyes from Fun at Home with Kids. Try this Sticky Marshmallow Play from Still Playing School. If you can’t wait for Christmas, why not make your own Marshmallow Snowmen from Milk and Cuddles. Try some new vegetables and learn about animals with this Edible Zoo from Fantastic Fun and Learning. I hope you enjoy trying these bins as much as we have. Please feel free to leave a comment with any queries, comments or suggestions and remember you don’t have to miss a single post! You can subscribe by email by entering your email address into the subscription bar on the right hand side of the page. What a fun list. We love sensory play at our home as well. We have to try some of these. Thanks, it was really fun to find all of the ideas too! Any time! I loved your edible worms and can’t wait to try them myself!